Legendary sheep hunter, Floyd Krank of Globe, Arizona, originally formed this outfit in 1979, under the name of Aravaipa Outfitters. At the end of the 1998 season, after many years of enjoying a very successful career, Floyd and his wife Mary chose to retire from the guiding and outfitting business. So, with the start of the 1999 season and with Floyd's blessings, Tim Mercier took over the ownership of the company after having guided for Floyd for a number of years. In 2007, after many years of guiding for Dry Creek Outfitters, Cliff St.Martin became a full partner of the outfit. Our first class tent camps use wall tents for cook shacks and have private separate sleeping tents that are roomy and very comfortable. We take pride in our gourmet meals freshly prepared with grilled meats, fresh vegetables, salads, pastas and rice dishes. "Services"
All our hunts are fair chase hunts conducted on Public Land. 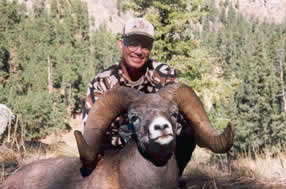 We guide sheep hunts in Arizona, California, New Mexico and Utah. 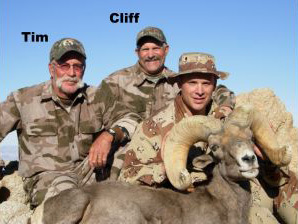 We hunt desert sheep as well as rocky mountain bighorn sheep in Arizona and New Mexico. In California and Utah we hunt desert sheep. Sheep hunting permits in all four states are issued through a lottery drawing. The application deadlines for Arizona and California are in early June, New Mexico is in early April and Utah is in February. Please contact us as early as possible for hunt application information. You can also contact California Fish and Game, Arizona Game and Fish, New Mexico Game and Fish, Utah Division of Wildlife Resources for information. All four states have Governor's tags for auction as well. They are generally sold at various fundraiser dinners. Many times our clients have taken the largest or oldest rams in the state and consistently take the largest rams in their unit. Your success is our success! We pride ourselves in quality, not quantity and we think that our past performance shows that hard work and experience pays off. You can be assured that our entire team of experienced guides will give 100% effort and dedication to finding you the largest ram in the mountain range for which you have been drawn. Dry Creek Outfitters are members of and support the following organizations: Wild Sheep Foundation, California FNAWS (CAFNAWS), Arizona Desert Bighorn Sheep Society (ADBSS), Grand Slam Club/Ovis, Society for the Conservation of Bighorn Sheep (SCBS), Christian Sportsmen's Fellowship (CSF), Boone and Crockett Club, Safari Club International (SCI), North American Hunting Club, National Rifle Association (NRA) and the Rocky Mountain Elk Foundation. We sincerely hope you will consider using Dry Creek Outfitters to assist you in making your hunt truly the hunt of a lifetime.